Oh wow. Work has kept me away from blogging something at length here and in my other blogs. But I think an update is in order on the pickled peppers I made a couple of blogs back. At first I was skeptical when my mother-in-law tasted it two days after it was made and she said it was delicious! Romesez (a friend from blogkadahan.com) said we need to wait for about a week so the spices can sink into the pepper. And that I did. When I finally got a taste of the pickled peppers, I found it yummy! It was sweet and sour and spicy all at the same time! And I got to chew up some peppers too, and it was crunchy and sweet and sour and spicy too! My wife said it gets better with time. The batch we made filled two bottles. I brought one in the office and the other is back home. When we have something fried for our meal (be it beef, fish, or pork), we use the pickled peppers as the dip. And when we're done with dipping, I munch up the peppers and carrots. Definitely yummy. It's inexpensive, and it's fun to make. You definitely must try some. It is still winter here but spring is around the corner. I hope to try your recipe with some of the fresh garden vegetables when they become available. Hello Mr. Abbey! That will be even more fun! Getting your ingredients fresh off the garden! Reminded me of the upo (gourd) my father planted in Baguio long ago. The elongated vegetable would hang on the trellis, and it's wonderful to see them growing along nicely. 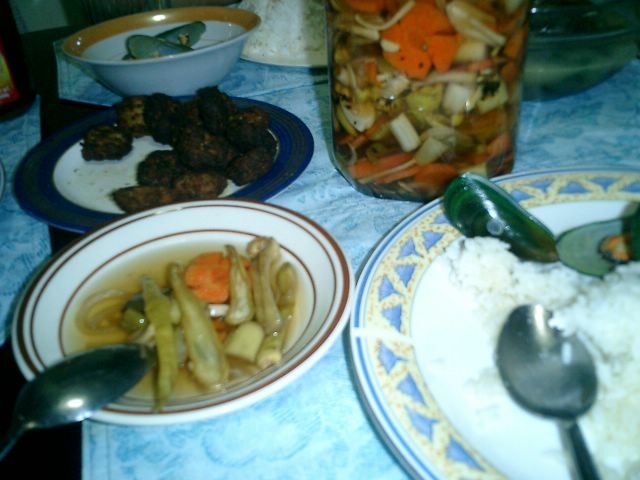 hi watson.i dont eat veggies but i think your achara looks nice and colorful.. hehe.. pang display sa kitchen for me..